Construction output is forecast to increase 5.5% this year before slowing to 4.0% in 2016 and 3.4% in 2017. 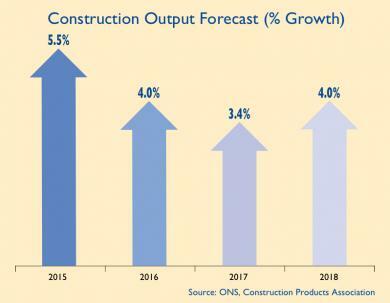 Dr Noble Francis, Economics Director, said: “Construction output is forecast to increase 5.5% in 2015, which is more than double the rate of growth for the UK economy, due to growth in the three key sectors of construction; private housing, commercial and infrastructure. Over the following two years, however, construction output is forecast to be adversely affected by the UK’s most uncertain election in more than 40 years. “The lag between construction contracts and work on the ground means that construction activity in 2015 probably won’t be impacted, since the majority of work for the year has already been planned. Instead, we expect a break in private and public investment this year for future projects, which in turn will lead to slower construction growth of 4.0% in 2016 and 3.4% in 2017. “Although fewer homes are being built than we need each year, private house building growth is forecast to slow to 5.0% in 2016 and 3.0% in 2017. Again, this is primarily due to uncertainty regarding government policy such as Help to Buy, which has otherwise stimulated house building in the last two years. This means that despite five years of recovery projected to 2017, private house building at that time is still forecast to be 19.2% lower than at the pre-recession 2007 peak. Similarly, increases in commercial activity are likely to be constrained by a hiatus in business investment this year due to the election, with growth in the sector expected to slow to 5.2% in 2016 and 4.4% in 2017.